With the wealth of waterways that run through Virginia Beach and feed into the Chesapeake Bay and Atlantic Ocean, there may be no better way to explore the beauty of our area than by floating right through it. For the perfect combination of excitement and relaxation, stand-up paddleboarding (SUP) is one of our favorite ways to experience our maritime beauty. Whether you own your own equipment or are renting from one of our many great local outfitters, there’s no shortage of options here. 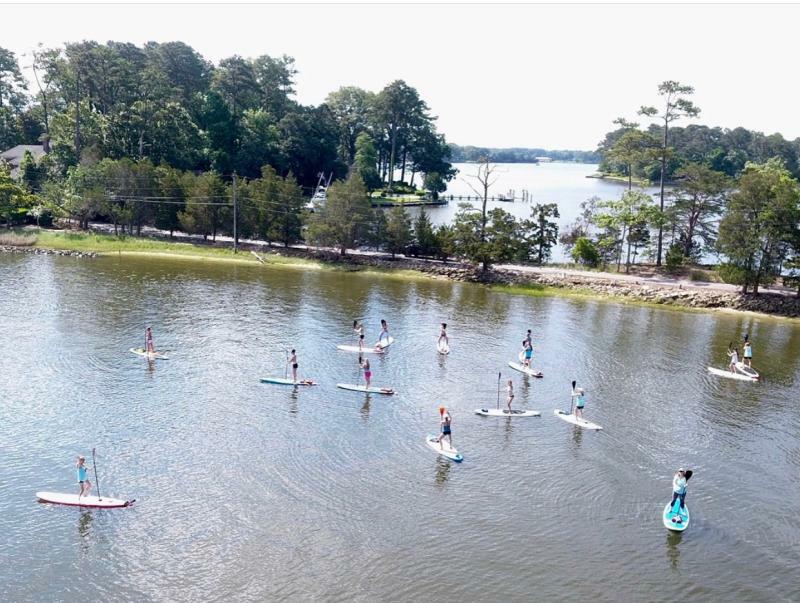 While more experienced paddleboarders can test their skill at the Oceanfront, here are some of our favorite places to get you started on your SUP adventure in Va Beach. 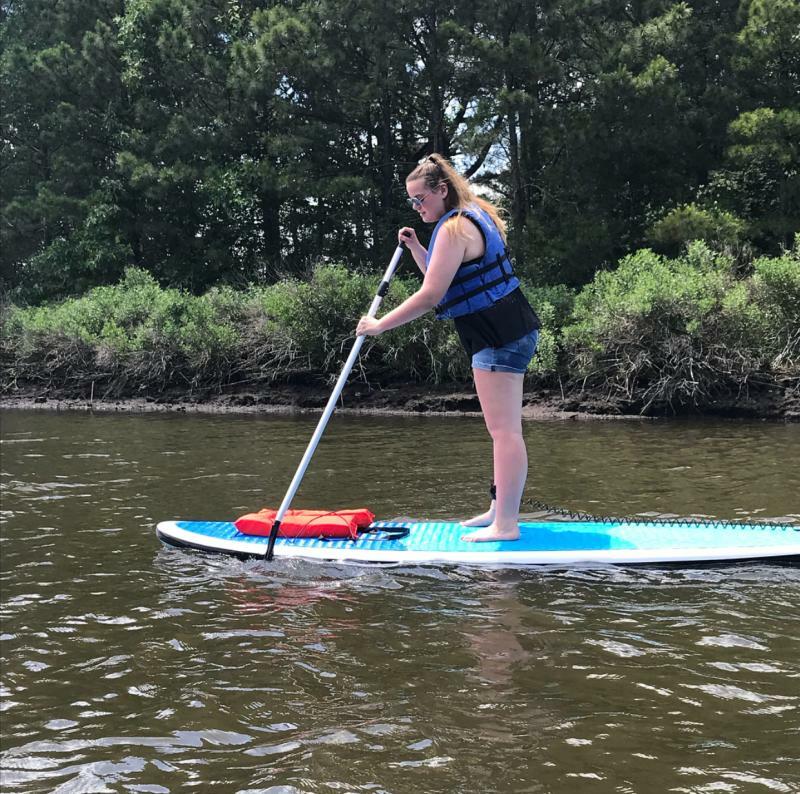 The tapering waterway bordering First Landing State Park, known to Virginia Beach locals as The Narrows, is one of our favorite places to explore via SUP. With its calm waters and low traffic, it’s also the perfect place to let your journey begin. You can even take your yoga practice to the next level with SUP Barre on the water in First Landing State Park. The hour-long session combines the rigorous full-body workout that you’d expect, with an added element of balance that can only come from standing on a board in the water. You’ll never want to go back to the gym again. With calm waters and beautiful views, these inland bays make for a relaxing adventure that requires no experience to get going. To take the views up a notch, local outfitter, Chesapean Outdoors, offers sunset guided tours for small groups, launching out of Linkhorn Bay. Feel free to bring your own equipment if you have it, but boards will be provided to anyone who needs them. The unencumbered beauty of Sandbridge makes it one of our favorite places to explore by water. Surf and Adventure Company has everything you need to get you on the water in no time. While you can rent your board and head straight to the beach, we’d recommend the gentle waters of Back Bay, where you can navigate through enchanting Spanish moss-adorned bald cypress trees and explore the wildlife inhabitants of the Bay Bay Wildlife Refuge. Surf and Adventure offers guided tours of both Back Bay and the Atlantic Ocean. While beginners are welcome on the bay, the ocean tours, launching at Little Island Park, do require experience. With more water movement, the Chesapeake Bay is the perfect step for those looking for more of a challenge. Equipment can be rented from nearby Tula Adventure Sports for a day spent navigating this beautiful body of water. 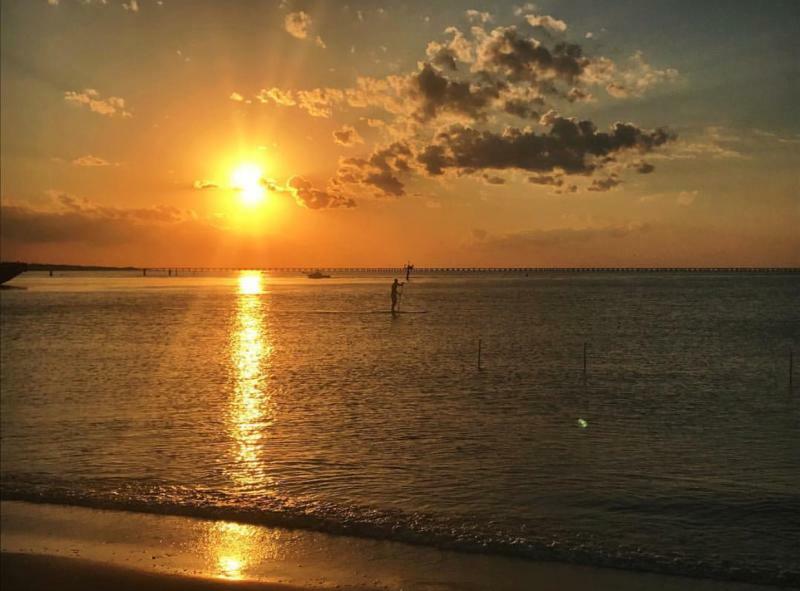 You can paddle out to the famous Chesapeake Bay Bridge Tunnel for some prime sightseeing or stay close to land for the perfect pairing to a beach day on the bay. Even if you opt to stay close to the beach, you can still often find yourself paddling alongside a pod of dolphins, which is an experience you have to see to believe. Plan your Virginia Beach Stand-up Paddleboarding adventure today!